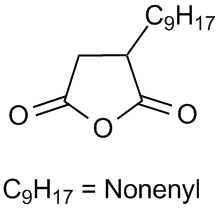 Nonenyl Succinic Anhydride (NSA), EM Grade | Polysciences, Inc.
Low-viscosity epoxy hardener yielding semi–flexible resins, suitable for electronics. NSA cured resins for improved water resistance. Detergent intermediate or hydrophobic, anionic attractant for metal cleaning.